New York - After Fox News Channel called Sean Hannity’s appearance at a Trump rally on Monday an “unfortunate distraction,” a further distraction was avoided on election night. 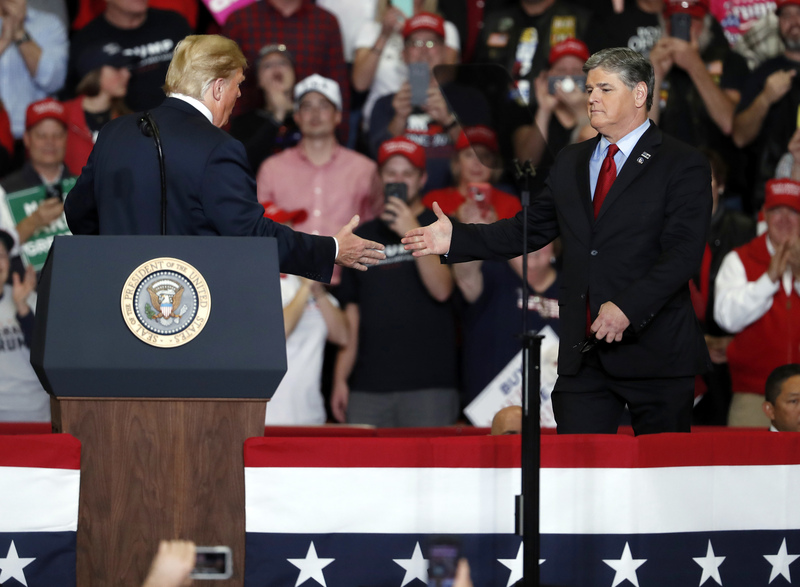 Hannity made no appearance on Fox’s midterms coverage, even though the network had previously announced that its prime-time opinion hosts Hannity, Tucker Carlson and Laura Ingraham would all be part of it. Both Carlson and Ingraham did appear. When Hannity and Fox colleague Jeanine Pirro were called to the stage and talked during President Trump’s final rally before the elections in Missouri, it was an embarrassment to the network. Fox said on Tuesday that it did not condone such campaign appearances, and called it a distraction from the work of its journalists covering the election. Fox would not discuss whether Hannity or Pirro faced any punishment. So when Hannity was a no-show on Tuesday night, it led to speculation that the network’s most popular personality was absent because of the network’s displeasure with the rally appearance. On his radio show Tuesday, Hannity said that he doesn’t work for Fox on election nights “because I am so neurotic.” He said he watches for returns on multiple televisions, phones and computers. “I think in 2016 I didn’t go to bed until 8 or 9 in the morning the next day,” he said. Hannity did find the time on election night 2016, when Trump scored his surprise victory over Hillary Clinton, to give a lengthy phone interview as part of Fox’s coverage. He was probably in the white house with Monica Lewinsky. As long as NPR funded by the tax payer can be tne liberal mouth peace it's all good . And of course they are allowed to lie and tout that they are not beholden to advertisers when they air their seasonal fund campaigns . Oh because they only have " wnyc sponsors " not ads . So now it's all kosher . Such liars and tax payer funded . What nerve . What a brainless remark. Typical of hashoteh. When FOX fires him Trump will make him Attorney General. “ As long as NPR funded by the tax payer can be tne liberal mouth peace it's all good . And of course they are allowed to lie and tout that they are not beholden to advertisers when they air their seasonal fund campaigns . Oh because they only have " wnyc sponsors " not ads . So now it's all kosher . Such liars and tax payer funded . What nerve . NPR reporters do not campaign on stage with candidates for office. NPR journalists do not tweet that they will not be on stage campaigning and then go on stage to a campaign. NPR hosts do not secretly advise a campaign and only make a full disclosure once they are outed. NPR reporters, journalists, and hosts do not do these things because they are real journalists concerned about real news, unlike Hannity who is a lying fraud and is nothing more than a Trump spokesperson hiding behind a "fair and balanced" mantra. He has made "fair and balanced" a joke. #2, I agree with you wholeheartedly. NPR has gone completely off the rails. Clip of what happened last time . Yet it's so obvious what they are advocating . And Brian doesn't hide his anti trump bias . Don't sell me your bs yoni about fair reporting . It's bull . It's malarkey . Listen to them for one day . You can't even say this with a serious face . Of course it's fake news And fox is not funded by tax payer . It has no mandate to be neutral . NPR does yet lies and is not neutral . One big fat lie . Just like tricky yoni yamsar user name . What’s wrong with you, you immature hateful brat?